20th Century Fox will be taking over the prestigious Hall H at San Diego Comic-Con shortly, and you can bet Shane Black's The Predator will feature prominently in their presentation. After several postponements (more on that later) one of 2018's most hotly-anticipated horror releases will finally hit US Theaters on September 14th. In advance of what's certain to be an unprecedented promotional push, producers just released another look at one of the film's titular Yautja via Twitter while the big Comic-Con event was going on. Already dubbed "The Fugitive Predator" this fine fellow is causing a minor stir among the franchise's most ardent supporters. Sporting sleek armor, a flattened face, and svelte features, some are hypothesizing this could be the series' first female Predator, or even perhaps a predator/human hybrid. The hybridization theory has already been floated in regards to "The Upgraded Predator", the 10-foot monstrosity featured in the film's latest trailer; the fiend's intimidating stature and exoskeleton have some hypothesizing he's actually part Xenomorph (a theory bolstered by Black's insistence that his film will reestablish the AvP connection). While excitement is still running high, those of us who have followed the movie's production since it was first announced over 2 years ago are only cautiously optimistic. 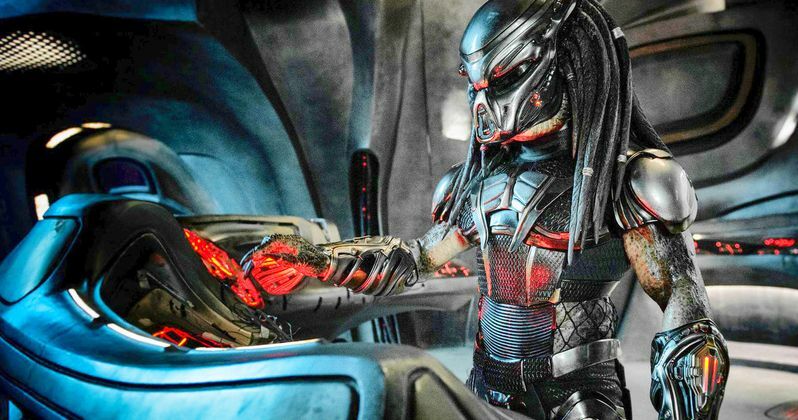 As previously mentioned, The Predator has been postponed twice; the first delay followed disastrous test-screenings in which fans groused loudly (undeterred by standard nondisclosure agreements). The second delay, announced in March, coincided with extensive reshoots; it was later revealed that Black eviscerated and retooled the entire 3rd Act of The Predator. While word on the street suggests changes were made in order to ratchet up the terror, we've also heard rumors that many of the film's creative creatures have been scaled back (though fans can still look forward to seeing "Predator Dogs"). Perhaps one of the most troubling details of The Predator's production is something that's gotten little attention: It was previously announced that the film was converted to 3-D after being filmed. I'll admit I'm 3-D averse; I consider the presentation a gimmick, one intended to distract from poor scripting while ultimately diminishing an overall aesthetic by causing sensory overload. I've yet to see a 2-D film that felt lacking, nor a 3-D production that significantly warranted (or benefited) from the added effort. Others may disagree, but those are my two pennies. Of course, no one will be forced to endure The Predator in 3-D, should they choose not to-and nothing could possibly keep me from seeing the film opening night! The film's sizable ensemble cast includes Thomas Jane, Jake Busey, Trevante Rhodes, Boyd Holbrook, Jacob Tremblay, Olivia Munn, Keegan-Michael Key, and Augusto Aguilera. Black co-wrote The Predator with Fred Dekker, writer/director of the cult horror classics Night of the Creeps and The Monster Squad. This news first appeared on the original Predator Twitter.